REPLACES 3 LB SHAKER BAG. NOW IN CONVENIENT SHAKER JUG! Protects about 1800 sq. ft.
Shaker Jug Of Granules Scatter onto flower beds. Protects against small critters like voles, chipmunks, rabbits, squirrels-as well as deer and elk. For protection against deer and elk browsing, sprinkle a 12"-16" wide strip around the perimeter of the garden bed. Lasts 6-8 weeks. The great thing about Plantskydd is that it lasts a lot longer than other repellents, because it doesn't wash off with rain. It lasts up to 6 months on shrubs during winter dormancy and just needs 24 hours to dry after application. Then you're all set. Made from dried blood and a tenacious vegetable oil binder that sticks to plants, it is 100% natural and 100% Organic. Listed by OMRI for Organic production, it contains no synthetic additives. It is effective for deer, rabbits. elk ,moose and other herbivores. "Plantskydd" is Swedish for "Plant Protection". It was developed there almost 20 years ago to protect young trees from hungry deer and elk through 6 months of severe winter and 3-4 months of the summer growing season. 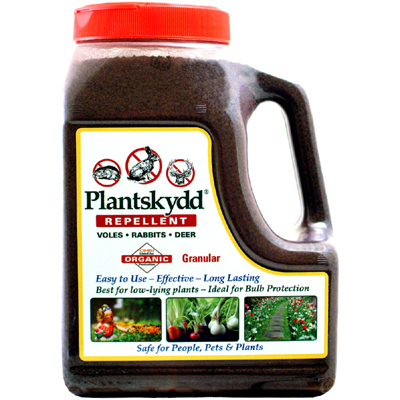 As a bonus, Plantskydd works as a foliar fertilizer spray and promotes growth naturally. 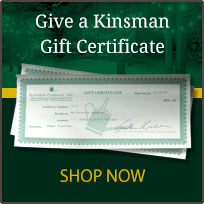 If you find Plantskydd doesn't work for you, just return the empty pack & your Kinsman receipt for a refund.